When water floods your basement or seeps into the walls and floors of your home due to broken pipes, toilet overflows, foundation seepage and other leaks, your home runs the risk of growing mold. Mold tends to thrive in moist environments, so if you see dark spots on your ceilings, floors or walls, contact the restoration professionals at Midwest Restoration Services. 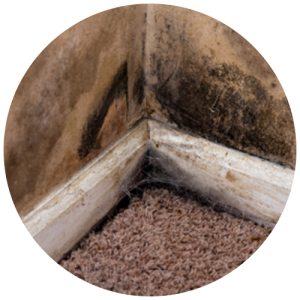 We’ll come to your home to assess the mold damage and work with you to find the best solution for your needs and budget. If your home or business has suffered from a mold infestation, it’s important to contact a certified mold remediation specialist right away. At Midwest Restoration Services, our experts have the skills and experience needed to efficiently restore the damaged interior of your property. We offer an in-house dry cleaning and laundering facility to help restore your damaged garments, clothing, furniture and more. Our mold removal professionals utilize the latest mold remediation equipment to properly decontaminate and sanitize your home or office. Contact our restoration experts today to learn more about our services, or get your free estimate online!